Combining some of Europe’s most spectacular sights and cities into a thrilling and action-packed 10 days! Only 10% deposit or minimum required to secure your tour (pay the rest off in instalments) and no booking fees. Our Price Beat Promise is to give you the lowest prices for our tours - guaranteed! All tour dates are guaranteed to depart. required and no booking fees. Pay the remaining balance off in instalments. Services of your Expat Explore tour leader. You've probably been watching it on screen for years. Now, see and experience Europe and its many world-famous sights for yourself! Cross through familiar destinations in France, Switzerland, Italy, Germany, The Netherlands and Belgium. 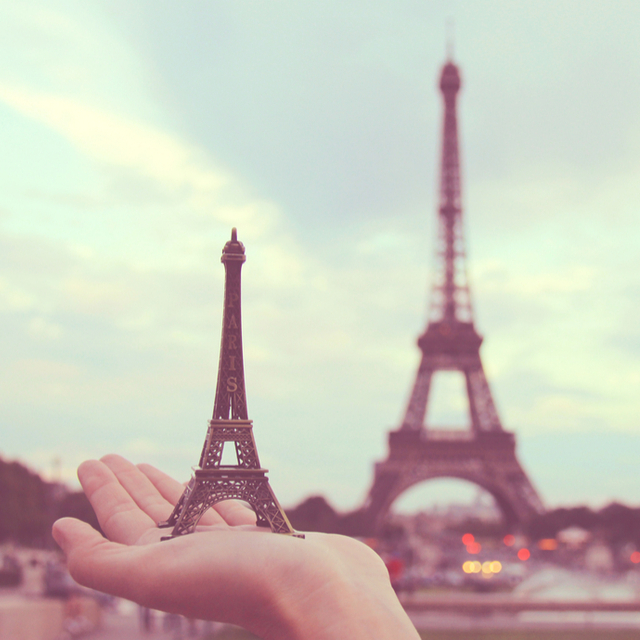 See the Eiffel tower in Paris - the most famous landmark in the world. Relax on a cruise of the Rhine river in Germany, one of the most spellbinding rivers in Europe. 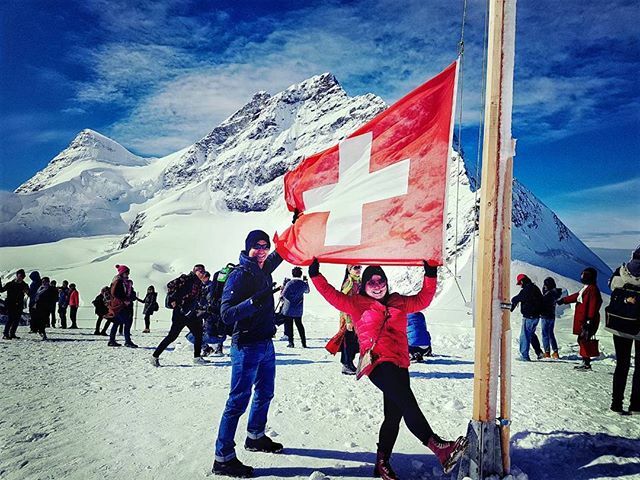 Travel by train to Jungfraujoch, the top of Europe with snow year-round. This flagship Europe tour is your ticket to an unforgettable exploration of Europe! a driving tour of Paris, a visit to the Leaning Tower of Pisa, a cruise of the mighty Rhine River in Germany and many more! We use a variety of hotels in each destination, so you may stay in a hotel different to that listed here. Hotels are selected closer to departure date; you will receive a confirmed list one week prior to your departure date. 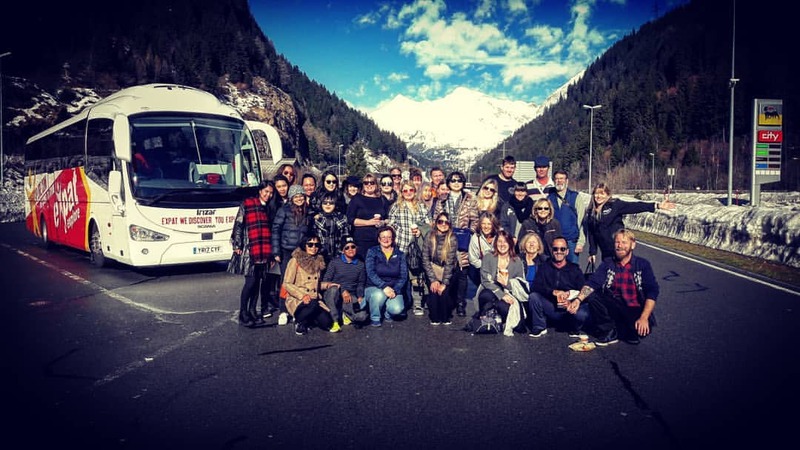 Welcome to the Expat Explore Europe Highlights tour! Leaving London behind us, we make our way to Paris, crossing the English Channel and arriving in the ‘City of Lights’ in the afternoon. We'll take you on a driving tour of the French capital; get your cameras ready - you’ll be seeing some of the city’s most treasured landmarks, including the Eiffel Tower, Notre Dame and the Arc de Triomphe! After the driving tour we'll enjoy dinner at a restaurant in the Latin Quarter, an eclectic, bohemian and historic neighbourhood. We'll then travel back to the hotel on Paris' world famous metro system, ready to explore the city further on our free day tomorrow! Driving Tour of Paris: we’ll take a driving tour of this famous city when you arrive. Look out for L’Opéra Garnier, the Tuileries Gardens, Place de la Concorde, Hotel de Ville, The River Seine, l'Ile de la Cite, the Louvre Museum, Eiffel Tower, Arc de Triomphe, Lovers Bridge, Sacre Coeur, Montmartre, Pigalle (the Red Light District) and the Moulin Rouge! * Stated prices and availability are subject to change. 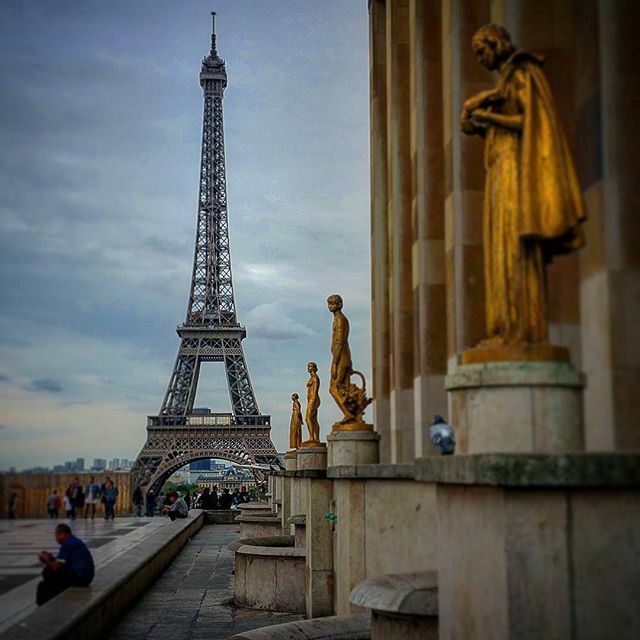 The wonderful thing about Paris is that it there is so much to experience, regardless of the time of day, or season. The Seine River is the backbone of the capital, and flows through the heart of the city. The banks are peppered with book sellers and market stalls if you wish to walk. But, why not choose a cruise, and sail your way past the grandeur of the gothic Notre Dame cathedral, to the epic Eiffel Tower? The commentary from the river boats will give you invaluable knowledge and information of the city. Famous architecture is scattered through the city, and ‘strolling’ is the best mode of transport for taking in every ounce of history. Paris Disneyland is perfect for the ‘young at heart’, and is only a short distance away. Your Expat Explore tour leader is brimming with ideas and local knowledge, so that you can get the best out of your time here. Lastly, don’t miss the opportunity to sample such French delicacies as frogs legs and snails! Burgundy lunch stop: enjoy a stop in Burgundy, a UNESCO World Heritage site and famous wine-producing region. You will have some free time to explore this beautiful medieval town centre and the opportunity to try local food and wine. Scenic Mountain Drive: spectacular views as we drive through mountain passes and alongside lakes, breath-taking mountain vistas and scenic views of quaint Swiss towns. We're off to Italy! Enjoy more breath-taking mountain views as we drive through Switzerland and on to see the famous Leaning Tower of Pisa! After some free time here (be sure to get the perfect photo!) we travel on to our accommodation in Tuscany, arriving in the late afternoon. Famous for its stunning countryside, fine food and wine, Italy's most beautiful region is guaranteed to delight you. 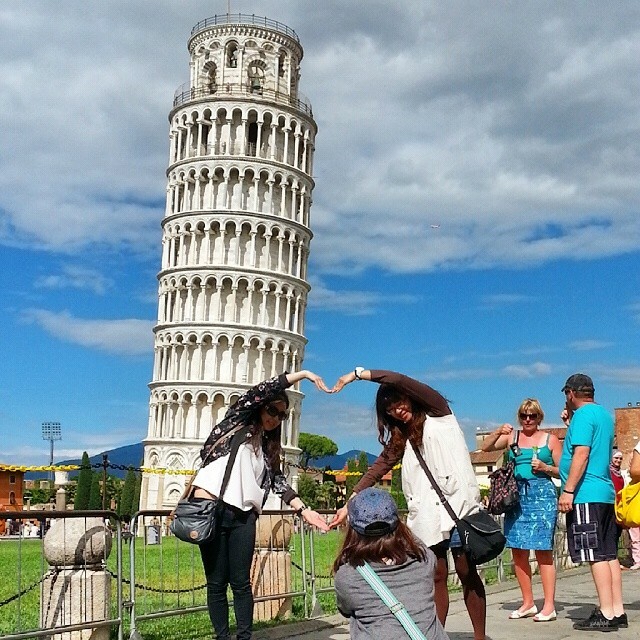 View the Leaning Tower of Pisa: your chance to see the world famous Leaning Tower of Pisa, or even take some iconic pictures of you ‘holding up’ the tower. Walking Tour of Florence: the capital city of the Tuscan region of Italy and considered to be the birthplace of the Renaissance. We will take you on a walking tour with a professional local guide where you will see Florence's Baptistery, Bell Tower, Gates of Paradise, Brunelleschi's Dome, Piazza della Signoria, Palazzo Vecchio, Ponte Vecchio. 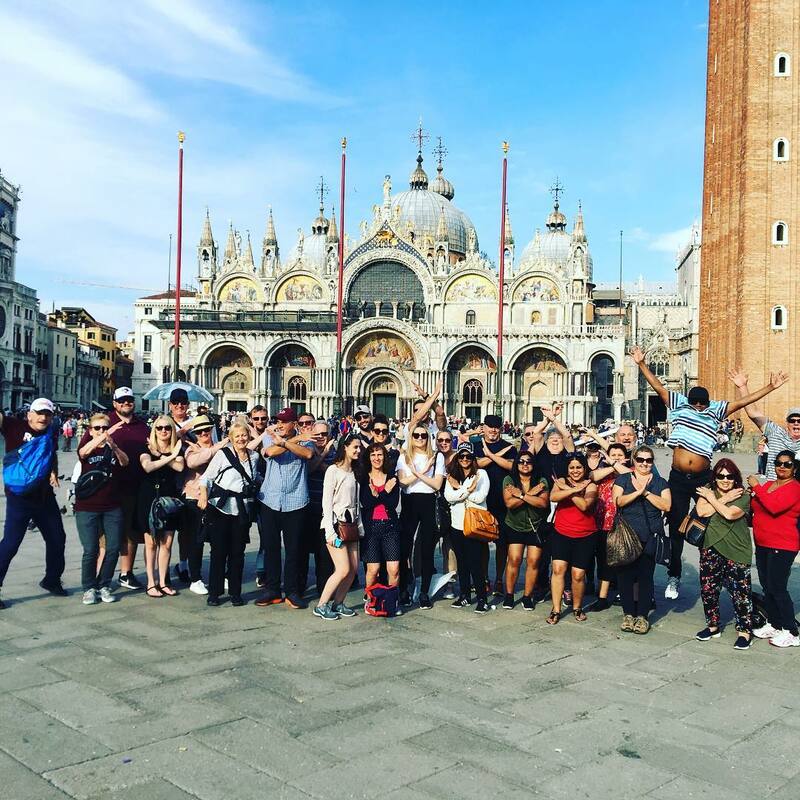 Orientation tour of Venice: your tour leader will take you into the heart of this unique floating city for an orientation to help you explore and see St. Mark’s Square, St. Mark’s Basilica, St. Mark’s Museum, Campanile (Elevator to the top), Doge’s Palace, Rialto Market and Scuola Grande di San Rocco. Arrivederci, Italy! Heading north toward Germany, you will encounter some of the most beautiful countryside in central Europe. The famous Brenner Pass will appear before you, and simply take your breath away, as we make our way to Austria for a comfort stop to get a taster of Innsbruck and its dramatic mountain backdrop. Arriving in Munich in the afternoon, there is plenty of time for an escorted walking tour of the city centre. A city that exhibits both prosperity and a certain amount of comfort and cosiness, Munich’s apparent contradictions will delight the avid explorer. Along with modern high-powered industry, designer shopping districts and sleek BMWs, you’ll find a wealth of cultural hot-spots. Even with all its smart sophistication, Munich has a certain charm that visitors find irresistible. 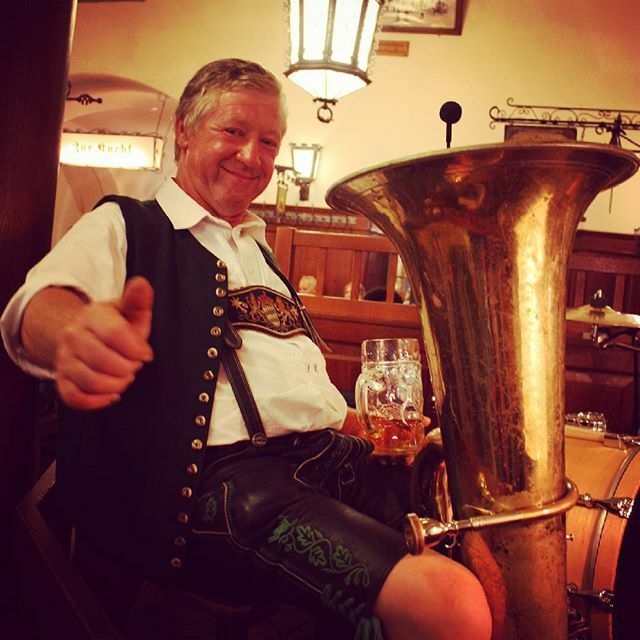 This evening, enjoy a beer in one of Munich’s traditional beer halls before dinner – a great way to round off the day. Prost! Scenic drive: cross spectacular mountain passes and experience some amazing mountain vistas. 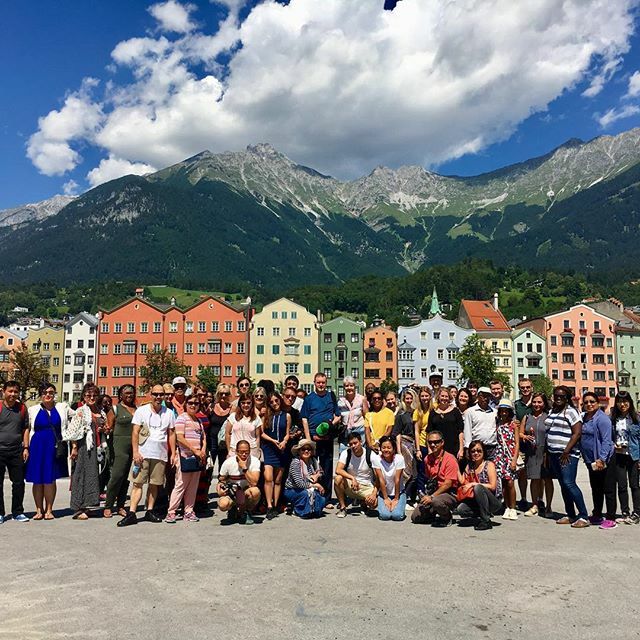 Visit Innsbruck: enjoy a comfort stop to experience this beautiful Austrian city that lies in a valley between high mountains, making for an incredible backdrop. Munich orientation tour: your tour leader will take you on an orientation tour of Munich, the capital and largest city of the German state of Bavaria. You will see Karlsplats and Marienplatz, New Town Hall, Church of our Lady, and if you visit in the winter the traditional German Christmas markets. Beerhall dinner: we take you to visit a traditional beer hall and sample some German food and drink, including famous German sausages (vegetarian options available) and beer. Rhine River Cruise: cruise down the Rhine and see the beautiful scenery and the largest concentration of gothic castles (Sterrenberg, Liebestein, Katz and Fortess Rheinfels). Rhine Valley Wine Tasting: visit a local wine merchants in one of Germany's most famous wine growing regions, and sample several types of delicious German wine. Popular varieties from the surrounding area and neighbouring regions include Riesling, Spätburgunder and Pinot Noir. The region is also well-known for eiswein (ice wine), a very sweet dessert wine made from grapes harvested in the freezing winter months. After breakfast our journey continues as we drive into the Netherlands, stopping off first at a windmill, after this quick photo stop enjoy a traditional cheese-making demonstration, and learn about how that most quirky and quaint of footwear choices – the clog – is made, before travelling onward to Amsterdam. Here we’ll check in to our hotel before joining a complimentary Amsterdam canal dinner cruise! Watch the city drift past as you sail along, and listen out for tips and interesting insights into the city from your tour leader. Reclaimed from the sea, these canals and massive harbour offer a truly unique way to see some of the city’s highlights. The evening is yours – explore the canals and Dam Square, and enjoy your time in this fascinating city. 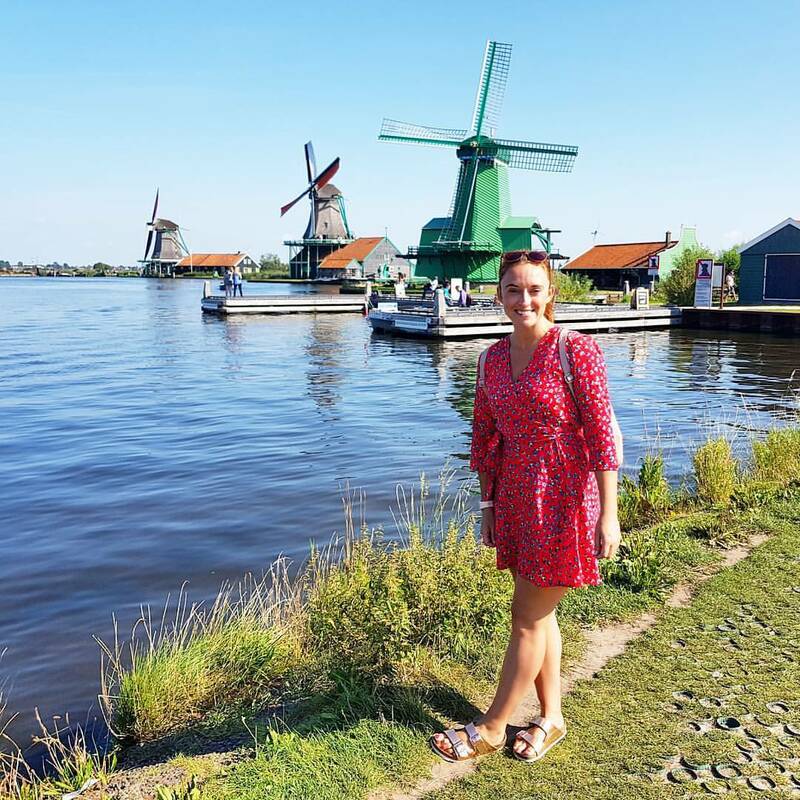 Visit the Riekermolen windmill: a great photo stop. Cheese and clogs demonstration: see how these famous shoes are traditionally made by hand and taste some fantastic cheeses. Of course the chance to shop and get those unique souvenirs. Amsterdam Canal Cruise: sail along Amsterdam's stunning canals at twilight and enjoy a delicious pizza as you cruise. A perfect introduction to Amsterdam you will cruise along Amsterdam's atmospheric canals. Choose from six types of pizza, Ben and Jerry's ice cream, and you can also upgrade to include unlimited soft drinks, beer and wine. Visit to Bruges: a stop in this beautiful medieval town with some free time so you could try the signature national dish of frites and moules, see or even climb the Belfry Tower, have a Belgian beer or buy some amazing Belgian chocolate. All optional excursions are booked on tour and paid in cash to your tour leader, unless stated otherwise. Please note, certain optional excursions are subject to availability and could change as a result. While others wait in long queues to get to the top of the Eiffel Tower, a better deal awaits those who want a view of Paris from the Montparnasse Observation Deck. 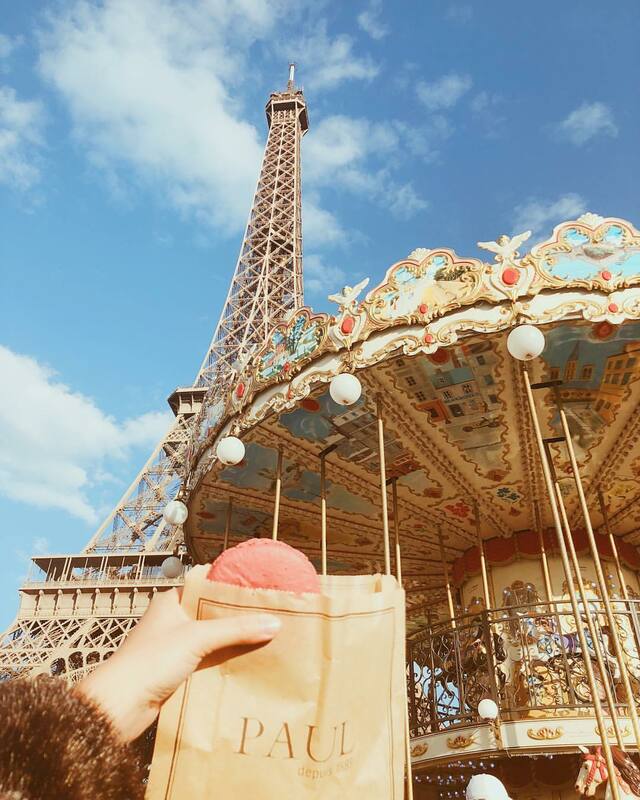 After ascending in the fastest elevator in Europe you will experience amazing views - including that of the Eiffel Tower – so your photos will capture Paris in all its glory. As well as the 56th floor restaurant and viewing platform, the 59th floor is an open air terrace on the very top of the tower. At 200 metres above the hustle and bustle of Paris, you can experience views of up to 40km in clear weather! Experience a fantastic show and the famous French Cancan at one of the top Paris cabaret venues, La Nouvelle Eve or Paradis Latin. The shows are lively, colourful, and tastefully produced. With striking decor, beautiful costumes and a variety of classic and modern choreography this is a show you will not want to miss. The price includes the show and a glass of French champagne. Embark from the foot of the Eiffel Tower and cruise down the river for a unique perspective of the beautiful city of Paris. The cruise will take you past landmarks including the Grand Palais, the Louvre, Notre Dame Cathedral and the National Assembly. Complete with commentary available in 13 different languages, during this 1 hour cruise you will discover the history and architecture of Paris. Get ready for a bumper day of Paris sightseeing, as your Expat Explore tour leader accompanies you on an incredible day out in Paris! First we tour the Fragonard Musée du Parfum, learning about the history of one of France's most famous perfumeries. 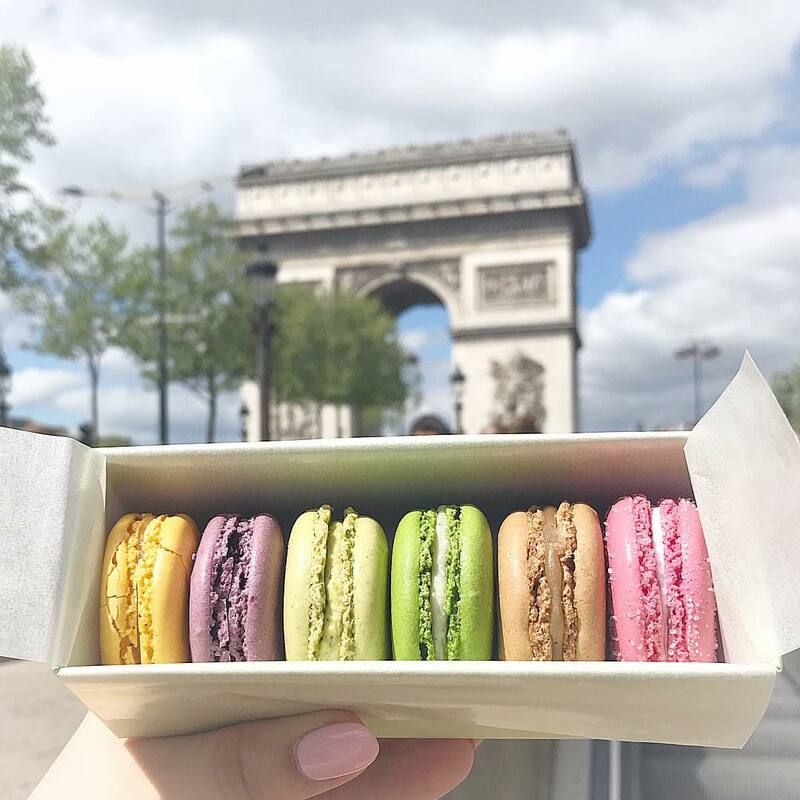 We then stop off at Place Vendome, the famous public square, on our way to the Ladurée macaron shop, where you'll get a taste of these sweet treats from the most famous macaron shop in the world. Your tour leader will then walk you through the Tuileries gardens and the grounds of the Louvre, including its famous pyramid. Next up enjoy a lunch cruise of the River Seine, including views of the Louvre and Notre Dame Cathedral. This afternoon we'll visit Tower Montparnasse, ascending 59 floors to experience amazing panoramic views of Paris. We'll finish the day off in the Latin Quarter, where you'll have some free time to explore and the opportunity to go inside the Notre Dame cathedral and do some souvenir shopping, before included transport back to the hotel. Please note: minimum numbers required. Enjoy an evening tour of the fabulous Montmartre area, known as the 'Last Village in Paris'. 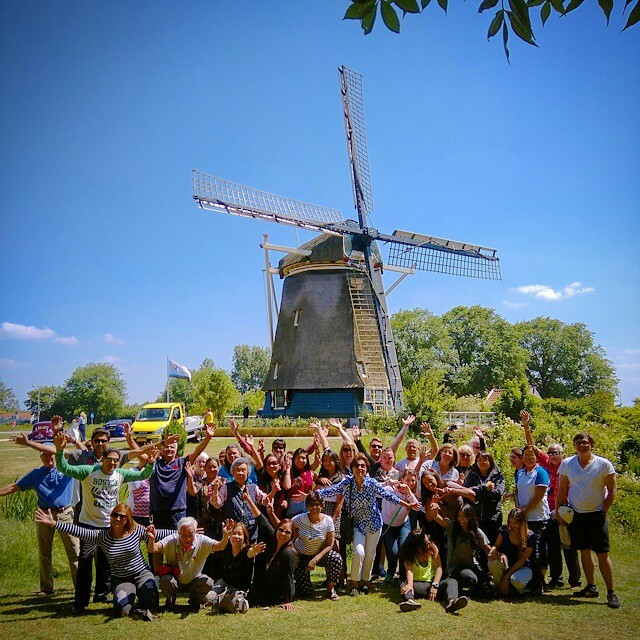 Led by your Expat Explore tour leader, you'll see the Moulin Rouge, windmills, fountains, statues, bakeries, gardens, vineyards, churches and more. After the walk, there is free time to take in the views and visit the Sacre Couer, followed by an authentic three-course dinner. You will have the choice of a variety of typical French dishes, which may include escargot (snails) or soupe a l'oignon (onion soup) to start, confit de canard (roast duck) or coeur de rumsteak (rump steak) for main, and creme brulee for dessert (vegetarian options are also available). You will take a 20 minute drive in a van to Beatenberg Amisbühl, the starting area, 800 meters above Interlaken, where you can enjoy the marvellous view of the Jungfrau massif. After a short walk to the starting area you receive all important information concerning the flight and then you are off. You’ll fly over Interlaken with an outstanding view of Lakes Thun and Brienz. This activity has a serious adrenaline factor with the bonus of a really great flight before you even get to the jump site. It all starts with an amazing 20 minute scenic flight. This takes you over the two lakes of Interlaken and through the Swiss Alps, seeing the spectacular peaks of the Eiger; Monch, Jungfrau in all their glorious beauty. This is followed by the thrill of free fall, with the comfort of being accompanied by an experienced instructor. 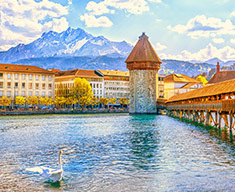 Set beneath the watershed of the Eiger, Monch and Jungfrau mountains, Interlaken is internationally renowned for its variety of rivers and white water rafting tours. River rafting opens the challenges of white-water to everybody. Teamwork and professional guides allow novices and veterans alike to enjoy the beauty and excitement of white-water rafting in the Swiss Alps. Take the train up to the spectacular Jungfrau glacier - via Europe’s highest railway station at 3454m. You will enjoy amazing views and there is a magical ice palace carved out of the glacier itself. You have the opportunity to play in the year-round snow, snowball fight anyone? This optional excursion has been voted the number one for the past two years and is a must on your European tour! What better way to enjoy your second evening in Switzerland than with a traditional Swiss dinner?! Fondue is a dish popular in Switzerland, France and Italy, with friends and family gathering around a communal table to dip pieces of bread into a pot of melted cheese. This three course meal includes fondue starter, sausage and rosti main course with salad bar, and dessert. A taste of traditional Tuscan cuisine featuring bruschetta and antipasto, Cannelloni a la Fiorentina (pasta), pork roast (vegetarian option available) with potatoes and homemade dessert. A glass of wine and water is included. This is a real delight to the senses and a hearty four course meal to top off a day of exploring. A gondola ride is the perfect way to appreciate the beauty and charm of Venice. 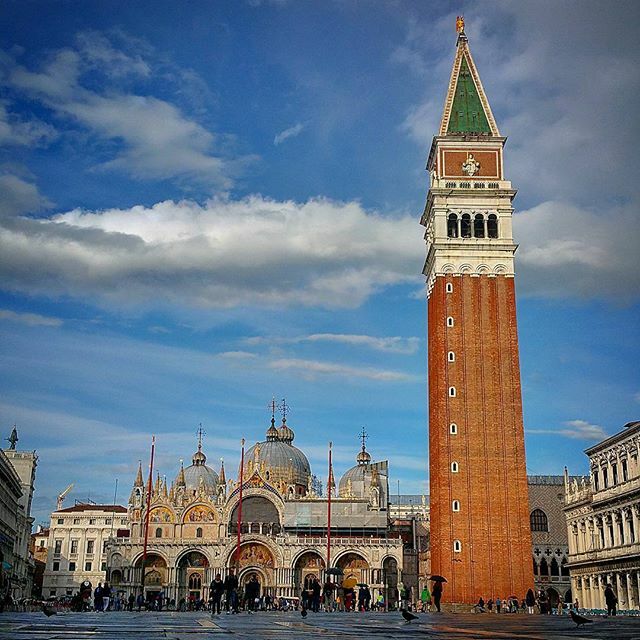 Feel part of an ancient Venetian tradition and experience Venice as the locals have for more than a thousand years. Your visit isn't complete until you have experienced this! *Please note gondolas can take up to 6 people, so you will be sharing your experience with other members of your Expat Explore group. After 19:00 hrs the cost will increase by an additional €5.00 per person. Whilst on your tour, you and your fellow passengers will have the opportunity to create and design your very own unique trip shirt or hoodie, a great keep sake and souvenir from your trip. You can also choose a polo shirt, girly t-shirt or singlet/vest. Once you’ve ticked a gondola off your bucket list, the next item to add to your Venetian experience is a cruise of the canals on a classic water taxi. Cruise along in style on these wooden motorboats with their leather seats and private drivers. If you’ve ever seen photos of Hollywood film stars arriving at Venice’s famous film festival, this is the way they travel! Explore the Grand Canal, the main highway of the Floating City, and see some of the main sights like the Santa Maria della Salute church, the cemetery island of San Michele and the Church of San Giorgio Maggiore. Want to spend some time in your tour departure location? We offer pre-tour accommodation! Our pricing model: Lowest-priced seats are sold first, then the price increases slightly. The quicker you book, the less you pay. Select a date below to secure your seat. Please complete the form and we will be in contact with you about this tour! Certain nationalities may require a visa(s) for this tour. Please see our visas page for more information. It is your responsibility to contact the relevant embassies to confirm your visa requirements. We provide support documentation upon request. Simply contact us. This should be valid for at least six months after you have returned home from your trip. You should also have several blank pages as Visas and entry/exit stamps can take up a whole page. Please refer to the tour itinerary for full details of what activities are included, which meals are included and what is excluded. We would recommend budgeting €25-€40 per day (this excludes optional excursions). Please note, by default all rooms are twin bed rooms. Partners: When you book for more than one person, we will by default group you together in a room (unless you specifically request us not to). If you are unequal numbers (3, 5, 7 etc.) and we are unable to secure a triple room then the remaining traveler will be roomed with another passenger of the same gender. Single Travelers: If you are travelling alone there is no compulsory charge - you will share a twin room with another passenger of the same gender. There is an optional single supplement/private room upgrade available for single travellers who wish to have a private room. This can be added at the time of booking or by contacting our customer services team. Please note that the room provided may be a single room with a single bed. Triple Room requests: We can generally provide a triple room on request; however it is not guaranteed to be available in every destination. Please contact our customer services team to request a triple room. Please note that in some hotels, the triple may be a double and a single bed, or the third bed may be a pull-out or bunk-bed. Where we cannot provide a triple room the rooming will consist of one twin room and the third passenger sharing with another single traveller of the same gender. In some destinations you will have a full free day, where you can choose to join our optional excursions or explore on your own. Socket C requires plug type C. Socket E is compatible with plug types C, E and F. Socket F is compatible with plug types C, E and F. Socket G requires plug type G. Socket J is compatible with plug types C and J. Socket L is compatible with plug types C and L.
A travel multi-adapter that includes plug types C and G will allow you to use all socket types encountered on this tour. If you are not staying in London pre/post tour you will not require an adapter for socket G.
Your tour starts and finishes in London. Please have a look at our essential tour information page for detailed information. Travel to the start point and from the end point is not included. We recommend using Sky Scanner to find the best deals on international flights. For a relatively small price, travel insurance provides you with the peace of mind so that you can enjoy your tour without any worries. All passengers travelling on an Expat Explore tour are required to have valid travel insurance cover, and you are responsible for arranging your own insurance - if you need assistance please contact our Customer Service team who will be able to put you in touch with our travel insurance partners. Our tours are not suitable for young children, so we set a minimum age limit of 10 years old. However, at the discretion of Expat Explore we may consider younger children on certain tours if they meet certain criteria and a request is received in writing via email for consideration. Expat Explore reserves the absolute right to accept or decline a booking at our discretion. Are international flights included in the tour price? No, you will need to make your own arrangements to get to the meeting destination for the first day of your tour. Make sure you keep departure times and possible delays in mind when booking flights. Please click here to visit Skyscanner - a useful tool for comparing prices from the vast majority of airlines. Are transfers included in the tour price? No, you will need to make your own arrangements to get to the meeting point for the first day of your tour. Please see the meeting point information for details on how to reach the meeting point, and for booking a transfer through Expat Explore. Can I access wi-fi on the tour? All of the hotels on this tour offer Wi-Fi, which is available free of charge as part of your Expat Explore tour. In certain hotels this will be available in the hotel lobby only, while in others you will be able to get access in your room. The coaches do not have Wi-Fi on board. If you intend to buy a local sim card to use while you are in Europe, please check with your service provider if your phone will work abroad. Can we start/finish the tour in Europe? You can start and leave the tour at any point along the itinerary. 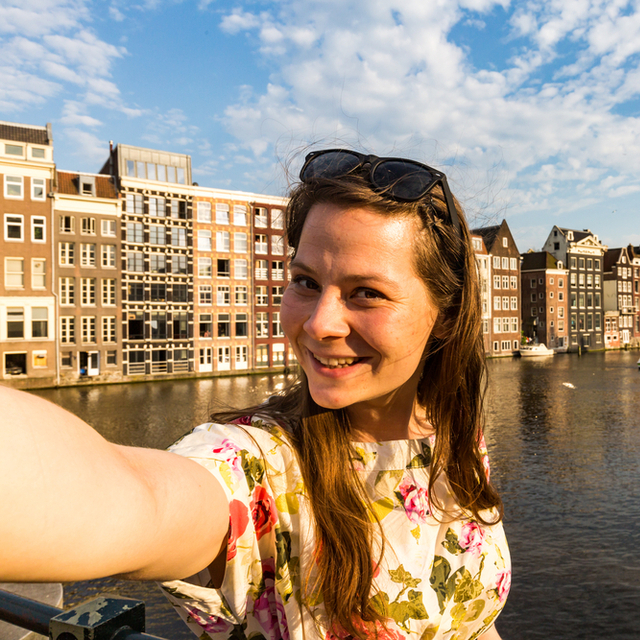 For example, on a Europe multi-country tour, if you require a visa to visit London, you may wish to start at the first destination in mainland Europe (Paris or Amsterdam) and leave at the final destination (Amsterdam or Paris) so that you skip the UK and only need to apply for a Schengen visa. It is important to tell us when booking, or as soon as possible after, if you intend to do this so we can send you the relevant meeting point information. Please note that there is no discount for starting and/or finishing the tour in mainland Europe. Before the tour starts, you will receive an email from us requesting your dietary requirements. There is always a vegetarian option, which is a meal without meat. We try as much as we can to offer you the traditional local cuisine. Can you provide a triple room? We can generally provide a triple room on request; however it is not guaranteed to be available in every destination. Please contact our customer services team to request a triple room. Please note that in some hotels, the triple room may consist of a double bed and a single bed, or a double bed and a pull-out or bunk-bed. Where we cannot provide a triple room the rooming will consist of one twin room and the third passenger sharing with another single traveller of the same gender. Can you send me a quote? The price shown on the website for your departure date on the day you book is the price you will pay. If you would like to make a group booking for 10 or more people please contact us. Can you tell me the name of the hotels I will be staying in? On the tour page we have listed the hotels that we mainly use for our tours on our website, but this is not a definitive list. A full list of confirmed accommodation names and addresses for your particular departure will be emailed to you around 1 week before the tour starts. If you are not starting the tour at the designated start point, and are instead joining later on in the route, please email us to confirm the details of the hotel where you should meet the tour. Do I get allocated a seat on the coach? Your tour leader will implement a seat rotation policy, so that everyone on board the coach gets the chance to have a different view from their seats each day. If you have any medical conditions that may be affected by where you sit, please discuss them with your Tour Leader, but note that the seat rotation policy will most likely mean that your request may not be honoured. Do I need a visa to travel on this tour? Certain nationalities may require a visa(s) for this tour. Please see our visas page and your pre-departure information for more information. It is your responsibility to contact the relevant embassies to confirm your visa requirements. Do I need to change money before the tour? Please make sure you bring with you for the start of the tour the local currency(ies) you will need for at least the first three days, as there may not be an opportunity to change currency at the very beginning of the tour. You should budget for any optional excursions you wish to do in this period (see 'Optional Excursions' tab above, these are paid in cash on tour unless stated otherwise) and non-included meals. We don’t recommend carrying large amounts of cash with you on tour; you are better off withdrawing enough cash to last you for the next 5-7 days, rather than carrying enough cash to last you for the entirety of the tour. Please refer to your pre-departure information for more information on the currencies you will require for your particular itinerary. When changing money please ensure that you are not given high denomination notes (for example €200 and €500 notes), as you will find most shops and restaurants will refuse to accept them, and your Expat Explore tour leader cannot accept them as payment for optional excursions. Do you have storage/left luggage facilities? No, we do not have these facilities. For security reasons, you will be required to keep your belongings with you at all times. Please bear this in mind when you are deciding what to bring. How can I get the documents I need to apply for my visa? Expat Explore can provide travellers requiring visas with visa support documents on a request basis. Please note that you are required to pay for your tour in full in order to receive the documents. This is an embassy/consulate requirement by law. Once you have received confirmation that your booking has been paid in full, you can request your visa support documents by emailing info@expatexplore.com - please allow up to 10 working days to receive these documents. You can book online through our website or call our customer service team to make a booking over the phone. You must pay a deposit of the greater of 10% or 50 GBP (or equivalent if booking in a currency other than GBP) via our online payment platform to secure your place. You can pay the remaining amount up to 60 days before departure, with a debit/credit card or with a bank transfer. How many other people will be on my tour? It depends on how many other people book! There could be up to 51 other passengers, so you will have the opportunity to make lots of friends! Due to weight and space limitations, you are allowed to bring one main piece of luggage weighing no more than 20kg, and one small soft bag for hand luggage. On all tours, you will have to carry your own luggage (e.g. into hotels and up to your room if hotels don’t have elevators). Please bear this in mind when you are deciding what to pack. How much spending money do I need for my holiday? This is up to you, of course, and will vary depending on how much wish to spend on snacks, drinks, souvenirs etc. We do not include entrance fees to attractions and museums. We do, however, provide you with free time to see everything you want, and our tour leaders will have all the information on pricing and locations so you can manage your own budget. Please refer to your tours specific pre-departure information and optional excursions guide for further details. How much time will be spent on the coach? Many of the countries are vast and varied, and there will be some long driving days on your tour. This gives you the opportunity to enjoy watching the changing countryside as it rolls past your window, to share music with your fellow travellers, watch a few movies or get involved in some of the games and quizzes hosted by your tour leader. Where possible, we have also included stops at points of interest. How much walking is involved in your tours? We believe the best way to get to the heart and soul of a city is on foot, surrounded by the people and the culture. For this reason, we do walking tours through most of the cities we visit. Many of the cities you visit are vast and old, often with steps and cobblestones. Our walking tours can last up to 3 hours with plenty of opportunities to take photographs and soak up the history of these fascinating places, but you do require a certain level of fitness to enjoy your tour to its fullest. Is Europe a safe place to travel to? Europe has a low rate of crime and corruption, and travelling here is generally considered safe and hassle free. Your tour leader will be on hand to offer local advice on each area you visit. The Foreign & Commonwealth Office (FCO) provides travel advice for each destination we visit – each country has a summary and general information as well as advice on safety and security, local laws and customs, entry requirements and health. Your deposit payment secures your place(s) on the tour and the price you pay. Your deposit paid at the time of booking is non-refundable. Our full Terms and Conditions can be viewed online. Yes, and you are responsible for arranging your own insurance. Passengers and their personal property travel with Expat Explore solely at their own risk. A suitable insurance policy should provide adequate cover for medical expenses arising through illness or accident prior to or during the holiday, and loss of holiday monies through cancellation or curtailment of the holiday or other insurable reasons. Clients should ensure that there are no exclusion clauses limiting protection for the type of activities in their tour. When on tour, ensure you keep personal belongings on you at all times and that your suitcase/backpack has a lock on it, especially in tourist areas. It may be advisable to wear a money belt to store money, credit cards and passport. For a relatively small price, travel insurance provides you with the peace of mind so that you can enjoy your tour without any worries. To receive a quote from one of our preferred travel insurance partners, please visit WorldNomads (for all nationalities) or Hollard (for South Africans). Should I tip the tour leader and driver, and if so, how much? Whilst we fully understand that some nationalities are not accustomed to tipping, this is a normal part of the culture in many of the countries we visit. Tipping has become an increasingly accepted practice in all areas of the service industry, but particularly in restaurants, bars and taxis worldwide. Expat Explore crew members (your tour leader and driver) will transform your trip experience from just good, to exceptional, and where this is the case a tip (even a modest one) is always highly appreciated. They will be travelling with you from just a few days, up to a few weeks, and you'll soon become good friends. It is sometimes easy to forget that they work hard to ensure that you get a once in a lifetime experience. At the end of your tour you will have the opportunity to thank your Expat Explore tour leader and driver by offering them a tip. We suggest somewhere between £3-5, €4-6 or $5-7 per person per day. Tipping is entirely voluntary and the above rate is offered as a suggested guide only. If you take a walking tour with a local guide, tipping these guides at the end of walking tours and excursions is always appreciated, but not expected. The tour I want is unavailable, what does this mean? If a tour is displaying as fully booked, then unfortunately at this point in time we do not have any available seats. However, we can sometimes add extra places, and we do occasionally receive cancellations, so if you cannot find an alternative tour or departure date, please contact our customer service team. What about room sharing & single supplements? If you are travelling alone there is no compulsory charge - you will share a twin room with another passenger of the same gender. There is an optional single supplement/private room upgrade available for single travellers who wish to have a private room. This can be added at the time of booking or by contacting our customer services team. Please note that the room provided may be a single room with a single bed. What happens if I forget or lose my passport? Unfortunately, you will be unable to continue the tour and you should make contact with your closest embassy immediately to replace the passport. Your passport is an essential travel document, and should be kept safe at all times. What happens if I miss the coach during the tour? You will have to make your own way to the next destination at your own expense. Please ensure you are on time for all departures to avoid being left behind. What happens if my visa gets rejected? Please allow sufficient time to complete the visa process (at least 4 weeks). Should your visa application be unsuccessful, you will be able to change or cancel your tour, but standard terms and conditions (and therefore fees) will apply. Please refer to our Terms & Conditions for more information. We now offer a Visa Deny Service for those passengers who have to apply for a UK visa or Schengen Visa. This service provides protection against the denial of these two visas which means that if your visa application is rejected, you will receive some of your tour money back. For more information please click here. The tour price includes accommodation for the duration of the tour, transport by private coach, breakfasts and dinner as per your itinerary, ferry crossings (where applicable), and guided walking tours and excursions as per your itinerary. On top of this, you will have a tour leader to assist you along the way with great tips and handy advice! Please refer to the ‘Included’ section of the itinerary where a full breakdown is given. What is the average age of your groups? We have a very wide range of ages on our tours, and do not restrict our passengers to certain age groups or limits. A positive attitude and an open mind are more important than a number! What kind of accommodation do you use on your tours? We have searched and invested in excellent accommodation options, either located in cities or well placed with public transport connections. Clean linen is always included, so you do not need to bring a sleeping bag. Towels are always included; however you may want to bring your own for use at the beach, swimming pool etc, if applicable to your tour. Toiletries (shampoo, shower gel etc) and hair dryers are not always included, so you may wish to bring these with you. Accommodation is provided in twin share en-suite rooms. We use a mix of mostly 2, 3 & 4-star hotels, and some hostels. What level of fitness do I need to participate in these tours? All travellers are required to carry their own bags, get on and off the coach and use public transport. Our city walking tours can last up to 3 hours and certain places involve walking up and down lots of steps. We want you to enjoy your tour, so read through the itinerary thoroughly and make your own conclusions as to whether you feel that you are fit and healthy enough. What time does each day start on tour? Generally, we like to make an early start, so that you can spend more time at each destination. On your free days, you can have a lie in if you wish! Where does my tour depart from? Tours departing from London are usually scheduled to leave between 06:00-07:00 in the morning, please refer to 'Tour Start & End Points' for confirmation. You should arrive back in London at around 18:30-21:30 on the last day of your tour, depending on ferry crossing times (if applicable to the itinerary) and local traffic. For our guests travelling from other countries to join this tour, we strongly recommend that you arrive a day before the tour starts, and leave a day after the tour ends, to account for any travel delays. Who will be my tour leader? Our tour leaders come from all walks of life, with different backgrounds and interests. 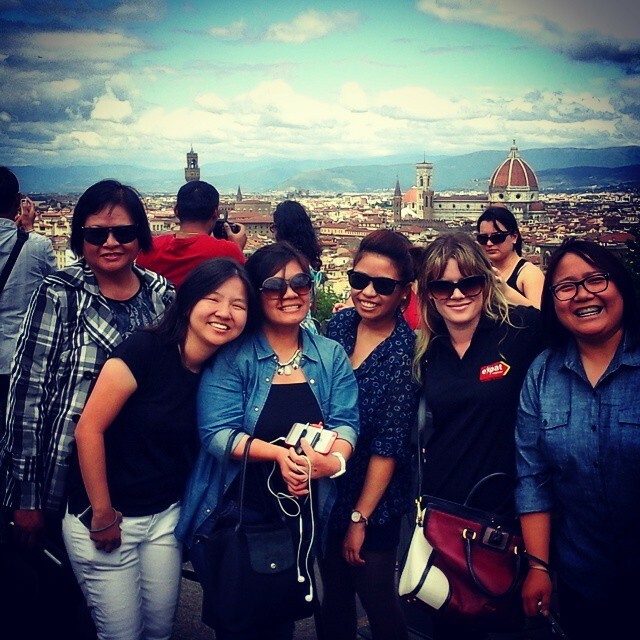 They are all confident and well-travelled with an in-depth knowledge of the destinations they are working in, and a passion for helping you make the most out of your Expat Explore tour. You will be emailed the name and contact details of your tour leader approximately one week before your tour start date. It is important that you keep a record this number so that you can contact your tour leader if you have any issues when joining the tour or during the tour. Will I get confirmation of my payment? As soon as your payment has been processed by our accounts team, we will send you a confirmation email. Please note this may take up to 5 working days, depending on your method of payment. Will there be an opportunity to do laundry on tour? For shorter itineraries most travellers are able to pack enough clothes to last them for the duration of the trip. For longer tours, you may need to plan for doing your laundry during the tour. Your tour leader will be able to recommend the best place for this. Hotel laundry services are less common in Europe and can be very expensive, so the tour leader’s recommendation will most likely be a local laundromat in a destination where you have at least a two-night stay. In bigger cities you may be able to use a laundry service, who will pick up from the hotel and then deliver the clean clothes back to reception. These services are operated by third-parties so your tour leader and Expat Explore will not be responsible for any issues - try not to bring any clothes with you that are valuable or sentimental in case of loss or damage. Alternatively, you could wash your clothes in the sink/wash basin in your hotel room, particularly if it's smaller items like socks and underwear. If you do, take care not to be too obvious when you hang them up to dry as most hotels do not like guests washing and drying their clothes in the hotel rooms. We suggest doing this in destinations where you spend two or more nights so the clothes have as much time to dry as possible.